We are specializing producer parts for disc brake and drum brake in the mainland of China. 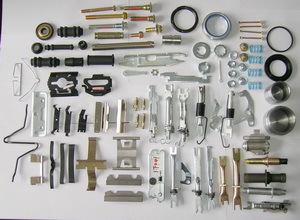 Our products including the brake shoe spring kits, brake adjuster screw, adjuster lever and other hardware for drum brake, caliper piston, seal and boot kit for caliper piston, bolt and bushing kit for brake caliper, pad clip, pad spring, and we produce wheel matel kit and self-locking nut and screw as well. We are supplying to Euro, North and South America, Middle east for OE and after market. We hope you find us as a satisfied supplier from China with good price and quality.